Yet another etude in vintage vibes. Vintage is the kind of topic I can discuss for hours. That's why there us quite a number of stories on Practical Queen AP dedicated to this stuff and namely my vintage finds. Vintage hunting, or simply shopping, is one of my favorite fashion directions. I really like going through old stuff and seeing how this or that piece can fit my wardrobe. It usually comes as a flash, you know. I just see an item on that rack and can totally imagine myself wearing it. The most disappointing moment with vintage stuff comes when it's not your size, especially a size down. But when it does fit, it literally is a jackpot. But you know I think I didn't understand the whole power of vintage until recent time. I have this vintage Sonia Rykiel pullover, one of my very first and coolest finds, I got 3 or 4 years ago. And now, after Sonia's departure in late August I started cherishing the pullover even more. I mean to me the item doesn't only hold her name but also possesses her true spirit. But well, Sonia Rykiel topic seem to fit in a completely separate story. Meanwhile, this post is about another vintage hero - the Escada by Margaretha Ley blazer. Another coolest find of mine. Cutting a long story short, Margaretha was originally a co-founder and chief designer of Escada, who passed away in June 1992. So the blazer is another piece in my vintage collection that did inherit its founder's authentic spirit? Yes, sir. 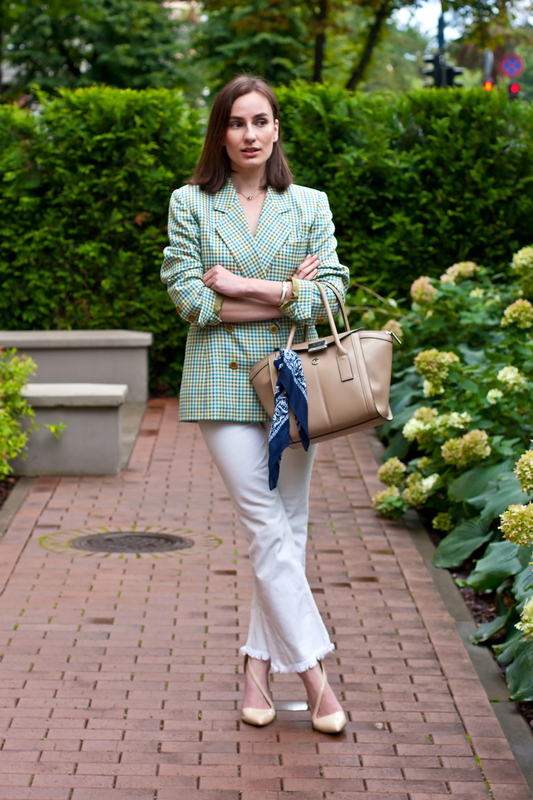 Putting all the founder's spirits and fashion-much facts aside, I really fell for this blazer the very first second I saw it. The lines, the pattern, the overall style seem to perfectly fit my uniform-like wardrobe and style direction. It was the color mix that disturbed me a bit, but at the end of the day the blazer can be turned as a colorful spot within 'almost all black' or 'white plus beige' formulas, right? Just like it happened in this very outfit. In my initial version, the one that dates back to March, the blazer was paired with blue jeans, white sneakers and a vintage bag. And I guess it will be fair to say that some outfit ideas require time to mature. I do like this version more as it does reflect the state I'm currently in, which differs from the March one.